← Grapefruit Macarons with Grapefruit Curd or Macaron Madness!!! I love spring vegetables. When we got this last week’s Mystery Box from Mariquita Farm, my kids and I were chomping on the baby carrots on the way home like they were candy. I always peek into the bountiful bag of treats before I drive away so I can scheme about what I will use for dinner an hour later. The agretti? The rapini? The spigariello? No doubt. 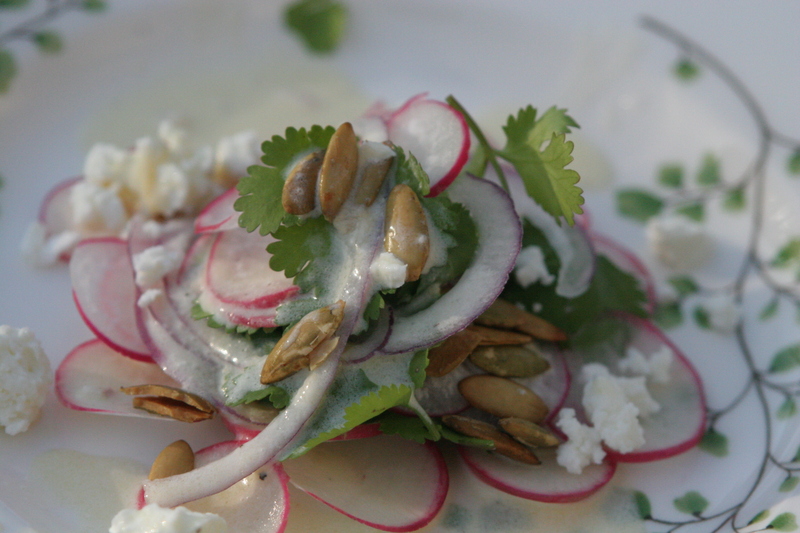 It had to be the spring radishes and the soft-leaved cilantro. The night before, feeling too worn out to make dinner, I had caved and purchased some tortas con chorizo y carnitas at Tortas los Picudos. I love all the garnishes they add to their sandwiches, but I am a sucker for the sweetened raw red onion, pickled vegetables, and extra cilantro. I wanted paper-thin radishes and red onion, a tangy cheese, the cilantro leaves, something crunchy, and a lime dressing. Unfortunately, I was all out of limes, but I did have my favorite Meyer lemons so I made a slightly creamy shallot-Meyer lemon vinaigrette. While Cotija cheese would also be fantastic in this salad, I happened to have Israeli feta on hand, which is just pungent enough to be stronger than a queso fresco, but soft enough for the texture I was craving. For the crunch, I decide to toast some pepitas (pumpkin seeds). Just like popcorn, if they get hot enough, they actually start popping because of the moisture inside and provide a really healthful and phenomenal crunch to the salad. Finally, in order that the red onions would not overpower the almost-sweet spring radishes, I sliced them paper-thin as well, letting them soak in cold water for ten minutes. This takes the bite out of them. Other hints I have are to layer the salad as you make it. 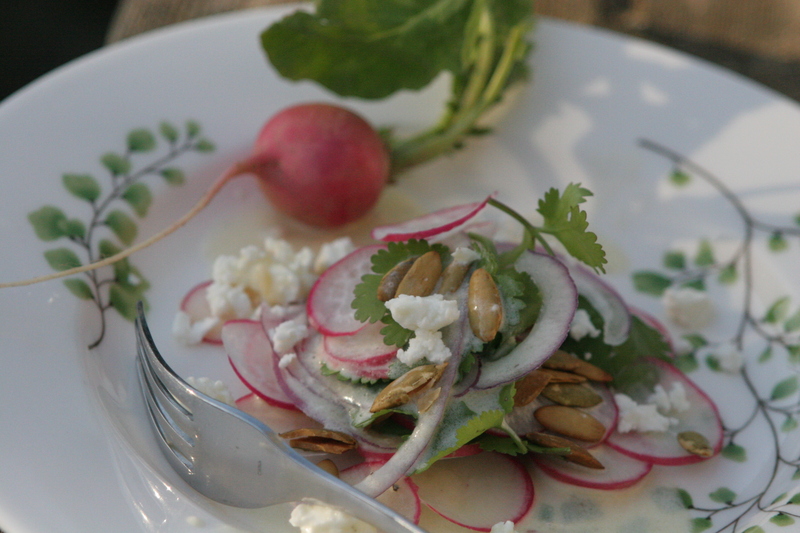 Slice all of your radishes, have your cleaned cilantro leaves ready to go, and your crumbled feta. I make a bed of the sliced radishes, maybe 7 or 8, and then I lay down a couple of leaves of cilantro, a bit of crumbled feta, and some of the toasted pepitas, then I repeat the process with a little bit less of everything. At the end, just to make it pretty, I drizzle the dressing over the top and then add a couple more pepitas and a few more crumbles of cheese. And it tastes even better than it looks. The only other thing I might change next time I make this is to zest a bit of the lemon (or lime, if you go that way) into the dressing to heighten the sour tang. I chose not to this time because my radishes were not that spicy and I thought a really strong dressing would diminish the flavor of the radishes. If anyone makes this with the lime, let me know how it turns out. I also can imagine a variation that includes a couple of teeny tiny breakfast radishes (uncut) mixed in with the sliced radishes. Or even a little bit of minced preserved Moroccan lemon. I have a few jars preserving right now so I will report back on how that tastes. 1. 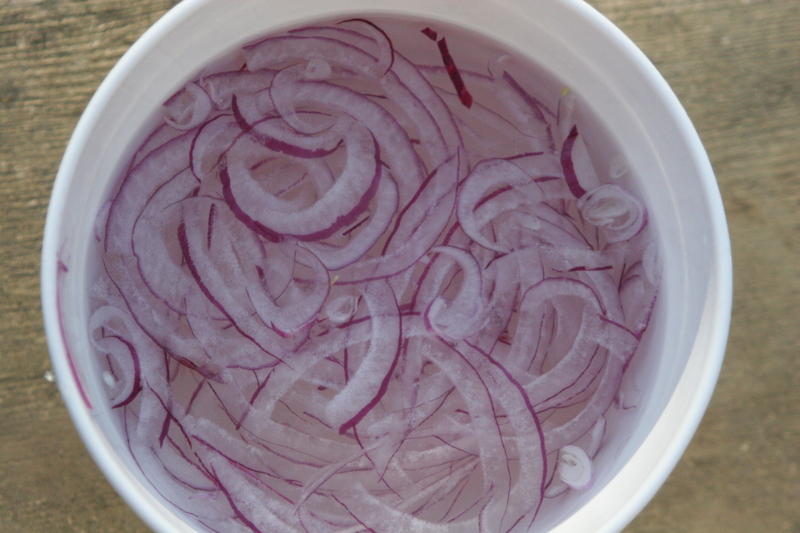 Thinly slice the red onion and add to a bowl of cold water for 10-15 minutes. 2.Toast your pepitas in a toaster oven or in a dry pan on the stove. Remove from heat and let cool. 3. 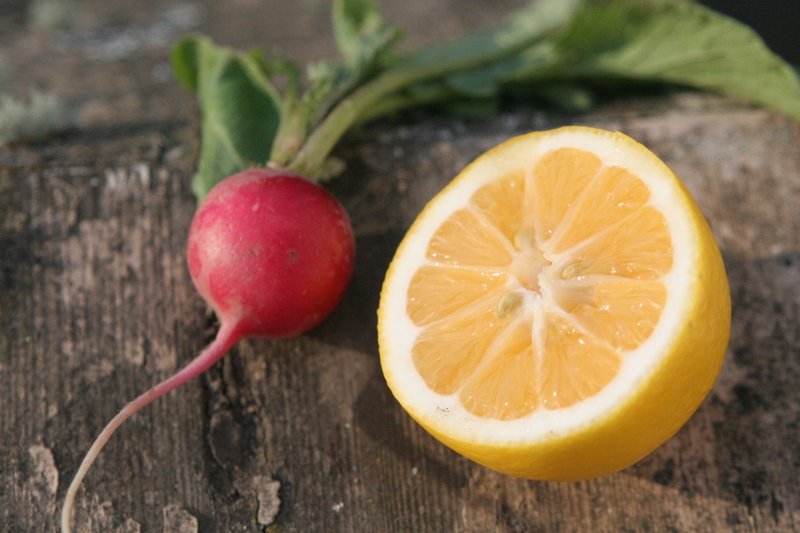 With a sharp knife or a mandoline blade, slice all of your radishes. 4. Make the dressing by letting the minced shallots macerate in the lemon juice and salt for a couple of minutes. Whisk in the olive oil, carefully stir in the cream, and add a bit of freshly ground pepper. Taste it to see if you need more pepper or salt. 5. Arrange the radishes, cilantro, pepitas, and red onion on a plate, building each part up and then layer more on top, without overcrowding. Drizzle the dressing over everything and then sprinkle more cheese and pepitas over everything. This entry was posted in Radishes, Salad and tagged Cilantro Radish salad with pumpkin seeds, Mexican radish salad, radish feta salad, radish pepitas lemon, radish salad red onion meyer lemon, Spring radish salad. Bookmark the permalink. Seriously, you take salads to a whole different level! Like your little ones, I love radishes (cracking up over the image of two kids fighting over a radish!). We just planted some in the garden this past weekend. I propose a garden veggie swap in a month or so! P.S. I’m looking forward to hear how the preserved lemons come out! You *should* be proud of that moment of the two kiddies fighting over a radish. Well-done, mama. Thanks for the tip on soaking red onions. My little man was asking about red onions the other day because, for some strange reason, he loves them, even though he doesn’t eat anything else very spicy. These Eastern Europeans just can’t learn to like cilantro, but maybe we can substitute parsley instead? Not the same, I know, but the rest of the salad looks delicious.